Tausug 101 – Learning Bahasa Sug the easy way! We now have an instagram account! Visit our IG account wherein we share common words to improve your vocabulary, some basic grammar lessons and featuring translations as well! Follow us @tausug101 and learn more about Bahasa Sug, the beautiful language of the Tausug! We have received a couple of emails informing us that our links to the different lessons in this blog is broken… (So… that explains the low view count of all those lessons! How many years have I left it like this? *face palm a thousand times!) My bad! Our deepest apologies to all those who clicked the links and was redirected to my old blog account. I am so sorry that I failed to update this until now. And now that our links are repaired, feel free to explore the page: “List of Lessons” and tick those checkboxes whenever you finish a lesson in this series. Thank you all for the continuing support! Today we will learn about the different colors in Bahasa Sug (Tausug) Here goes! yes! You read it right! The Tausug101 team* is currently working on this Youtube Channel to better help those who want to learn Bahasa Sug. And if you haven’t followed our accounts in FB and twitter, better do it now! By team I mean me, myself and I. This is the introductory post for the series of posts “TAUSUG 101: Learning Bahasa Sug”. But before beginning our long—yet fun—journey in learning Bahasa Sug, here are some bits of information we need to know first. A lot of people always get confused with the terms “Tausug”, “Sinug” and “Bahasa Sug” (I myself got into a I-thought-I-was-right situation just lately). We come to ask “Do they mean the same thing, or are they different?” something which must be explained when we want to learn the language itself. Although the three terms are most of the time used alternately to refer to the language (which is quite wrong and confusing to do so), a clear distinction must be made between them to avoid further disorder in this world! A wonderful day. let us begin a new journey! 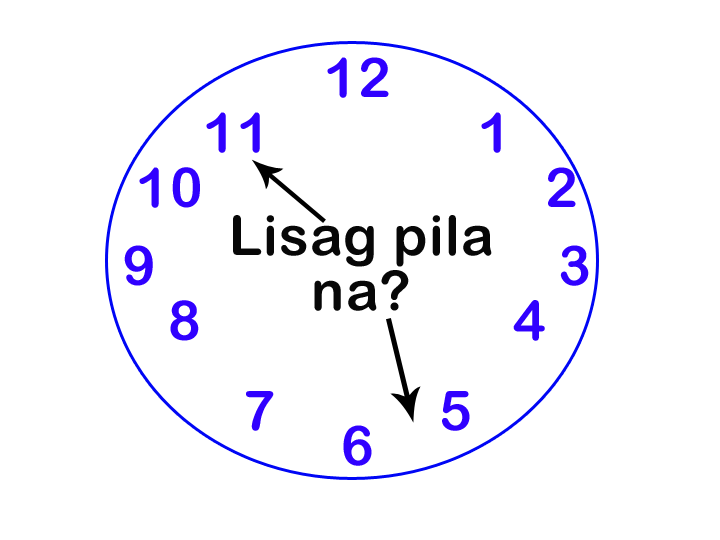 Today in sha Allah we will talk about how to tell time in Bahasa Sūg. It’s simple so I would expect that you could learn this in a day or two. First here are the things we need to review or learn first for those who haven’t read the other lessons. The basic way of naming numbers in Bahasa Sūg. You can access the old post I published about this topic in: NUMBERS in Bahasa Sūg (I haven’t edited this post yet, there might be some mistakes in there). Just learn the numbers from 1-59 first, coz that’s the only thing you need to know to tell time haha.